Lack of ambition is certainly something to be criticized in filmmaking, but is it equally fair to bash too much ambition? It is clear from the outset of The Dark Knight that director Christopher Nolan is out to raise the bar with this film, not just for the Batman franchise which he resurrected so well with Batman Begins (2005), but for comic-book superhero films in general. If I do take issue with the structure, content and pacing of this epic blockbuster, then it is that it tries to do too much rather than too little; ultimately, I would rather films attempt to raise their sights high rather than settle for mediocrity, so it really is to Nolan’s credit that The Dark Knight is so ambitious, even if it falls just short of the mark. Batman Begins was in many ways an easier film to assess, as it was a wholesale redrawing of what had become a tiresome, lumbering film franchise. It was a real success; a fine cast, gripping story, striking visuals, and enough subtext to keep both the comic purists and the critics happy. It was also a box-office hit, and one which naturally invited a sequel. Three years later, in which time Nolan gave us the labyrinthine The Prestige (2006), we return to Gotham City, where Batman has now become a rather more familiar figure in the public eye. Impersonators have begun to spring up, reflecting his symbolic status as someone who could bring hope to the metropolis’ crime-ridden streets. But now there is another source for optimism in the person of new District Attorney Harvey Dent, elected on the promise of eradicating the Mob, only by legal means. The story neatly intertwines with that set up in the earlier film; Bruce Wayne is a reluctant hero, and is all to pleased to see that the new DA could see him able to hang up his batsuit for good, and make good on his promise to his beloved Rachel. Unfortunately, Rachel happens to be both assistant to and romantically involved with said Mr Dent, and so a complex love triangle inevitably ensues. Meanwhile, we are introduced to the Joker, who seems just like an ordinary petty criminal, except with a rather macabre taste in make-up strategies – face as white as Michael Jackson’s, green hair and a blood-red-smeared Chelsea smile. Swiftly we begin to sense that there is something unconventional about his intentions: money is no object for him, instead a rather macabre sense of humour which seems to thrive on pain, torture and random violence. This much is well poised for a rollicking action-packed rollercoaster-ride, and throw in some police corruption, car chases, races against ticking clocks and moral dilemmas and surely you have a recipe for success? Well, yes, but with reservations. Firstly the good: and the goods are really good. DP Wally Pfister’s Gotham City is amazing, and the urban cinematography throughout is absolutely top-notch, creating the moody backdrop necessary for the story to play itself on top of. The idea of a coherent, living city, is also fleshed out with the characters which populate it: those already mentioned, as well as police lieutenant James Gordon and his not entirely trustworthy force, the various mobsters, hoodlums and gangsters who control sections of the city, the more ‘respectable’ businessmen with whom they co-operate, and of course the television reporters and commentators – see Robocop (1987) for how important these are for creating a believable fictional world. And then there is the impeccable cast: another extraordinarily nuanced, subtle performance by Gary Oldman as Lieutenant Gordon, Maggie Gyllenhaal outdoes Katie Holmes as Rachel Dawes, Aaron Eckhart is entirely believable as Harvey Dent, and who else but Morgan Freeman and Michael Caine could be Bruce Wayne’s technical staff? If anything, Christian Bale has the least to do, save for be shown a few blueprints and new gadgets, and mumble in that emphysemic voice whilst under the bat mask. 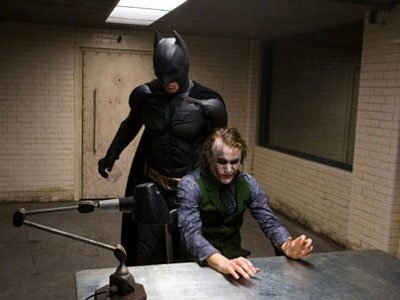 But of course, the performance which has drawn most attention is that of Heath Ledger as the Joker, and not without reason: the brooding pinup completely throws himself into the role of a psychopath, replete with odd mannerisms, explosions of violence, and a strange demonic voice just the wrong side of Al Pacino. Quite unlike anything we’ve come to expect from him before, and what a shame that we will not be able to see any more of his many talents. With such talent at his disposal, Nolan is able to explore themes which other films might shy from. The psychopathic Joker presents most of these for us on a plate: the questionable nature of insanity, the role of chance in our lives (see No Country for Old Men), the idea that both he and Batman are ‘freaks’ and outcasts from society. The situations that he invents for Batman, and Lt Gordon, to agonise their way out of ensure as great a degree of soul-searching and moral questioning in the audience as in the characters we are watching. Harvey Dent, too, is forced to confront things he would not wish to face, one of which causes a profound change in his outlook on life that cannot be revealed here, but needless to say it is caused by more clever scheming by the criminal Joker. So, much to recommend of the film. So why my aforementioned reservations? For one thing, it is too long. At 152 minutes, it is only 12 minutes longer than its predecessor, but that had the job of recasting the whole franchise; here, all we need is a story on top of that. There is a definite sense of what i would term cliffhanger fatigue – one too many ticking clocks for the hero to stop from counting down to zero for its own good. It is also a little confusing at times, by sheer volume of plotting; early on I felt more than a little lost amidst all of the intrigues and strands of storyline which it was setting up, and was more than happy to see a more familiar, simple structure begin to emerge as the running time went on. Again, there is just too much going on at times, which is fine for a slow, thoughtful arthouse film, but for a giganto-blockbuster it is just too much. So what, overall, to make of such an epic work? As a blockbuster film, it is so much more thematically profound, visually impressive and better performed than nearly everything else out there that is seems a little unnecessarily negative to start to pick holes in it. But the high standard of Christopher Nolan’s previous work demands that such rigours be placed on his output, and I do have to say that this feels like one of his least tightly-controlled films. As much as the likes of Memento (2000) and The Prestige (2006) were ambitious in what they set out to achieve, they both succeeded on their own terms. The Dark Knight reaches just that bit too far for its own good, but at least it tries, and goes most of the way, to the greatness to which it aspires.